Modular kolo ocelové v chromu 10.0 x 15" - ET (-37) - PCD 4 x 130 mm 1ks (bez E-značky). Modular wheel chrome 10.0 x 15 - offset (-37) - PCD 4 x 130 mm each. The Modular is like the Mangels completely of chrome steel with the Modular has 10 round holes. This rim is in many widths with different offset options. Through these many possibilities, the Modular rim wildly popular with buggies, baja's and trikes. 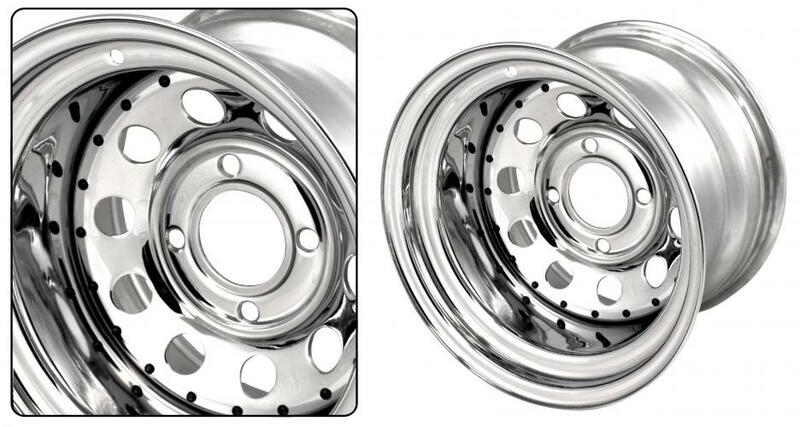 Modular wheels are supplied without wheel caps, these are however available separately. Modular kolo ocelové v chromu 6.0 x 15" - ET +10 - PCD 4 x 130 mm 1ks (bez E-značky).